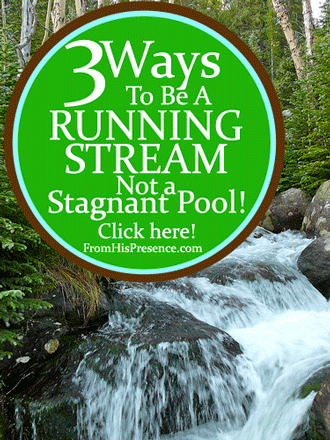 A running stream is beautiful, invigorating, and refreshing. It fosters life wherever it goes. A stagnant pool is a breeding ground for infection and death. It’s the opposite of a running stream in every way. Stagnation is definitely out. I want to be a running stream and I’m sure you do too. So how can we accomplish this? How can we have new, interesting things to talk about? How can we keep the flow of new ideas going? 1. Identify something you’re passionate about, and learn about it on an ongoing basis. Do you like food? Take a cooking class–even if it’s only a one-night class! Ongoing learning lights a spark in us that fuels our passion. It gives us exciting things to talk about with others. Learning = freshness! 2. Find someone to teach or mentor. This can be super-simple. You don’t have to be part of a formal mentoring program (although you can be). Just helping someone else–seeing the light come on in them–will be so invigorating for you. It will remind you why you love doing what you do. Do you play violin? Offer to help your neighbor’s child who’s struggling with his violin lessons. Do you enjoy public speaking? Enroll in a Toastmasters group and help encourage brand-new speakers. Are you great at writing resumes? Keep your ears open for someone that needs a job, and offer to help him put together a killer resume. 3. Block off time on your calendar to do what you love to do. I love scrapbooking, but it’s been a long time since I’ve done it. I need to look at my calendar and reserve a weekend just for scrapbooking. Artistic expression fires me up like almost nothing else. Do you love to worship God? Set aside a weeknight, tell anyone who asks that you’re busy, go home, and put a worship CD on. (Ooh, I know of a really good one. Click here for the best solo piano worship CD ever! 😉 ) Just sit alone with Jesus and worship your heart out. Want to run a 5K? Block off your lunch break three days a week, and hit the treadmill at the gym. By learning, teaching, and refilling your “tank,” you can stay fresh. You can always have something new to offer; a fresh revelation or idea; and passion for your mission. What are your ideas about how you can stay fresh like a running stream? I’d love to hear your ideas; leave your comments below! 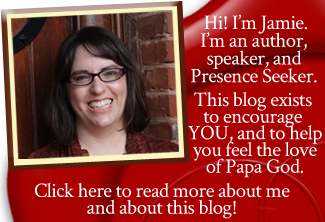 Note: The book link above is my Amazon affiliate link. Image courtesy of F Delventhal on Flickr.